I have never written about my obsessive interest in prehistoric figurines carved from rock, ivory or sometimes modelled in clay. Does it need to be emphasised? Perhaps as a subject of embarrassment? The interest is obvious if you glance through the library of my visual work. I produced my first drawing from a photograph of the famous Willindorf Venus early one morning, in a flat on Leith Walk, just around the corner from Pilrig Park. I had recently moved into my girlfriend’s flat.I have a distinct memory of that period after I moved into that shabby flat near the top of Leith Walk. I had taken some of my books with me one of which must have had a photograph of the Willendorf figurine. 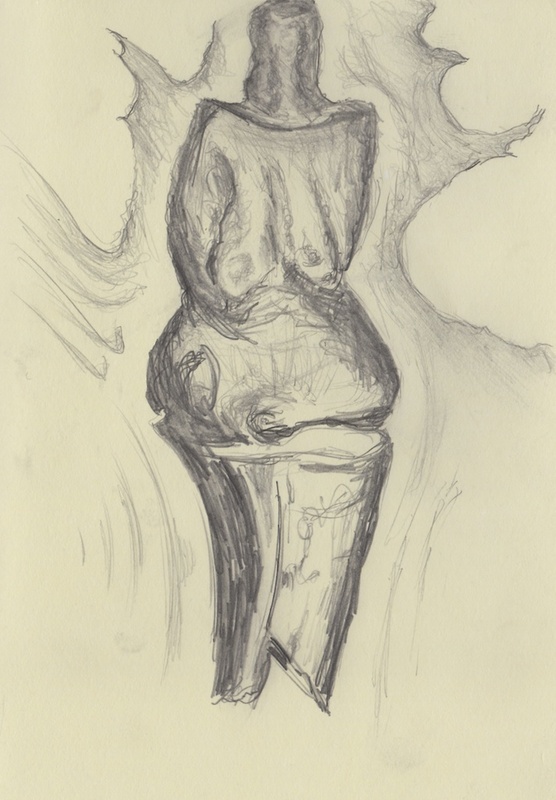 I woke very early one morning and produced a detailed drawing of the Venus, in one sitting. That drawing now is faded, into its recycled paper. As with the carving itself, it has a crude, violent, primitive quality, and to be frank is not a skilled drawing. These miniature statuettes stir deep feelings in me. These feelings have a sexual element, firmly procreative in nature. 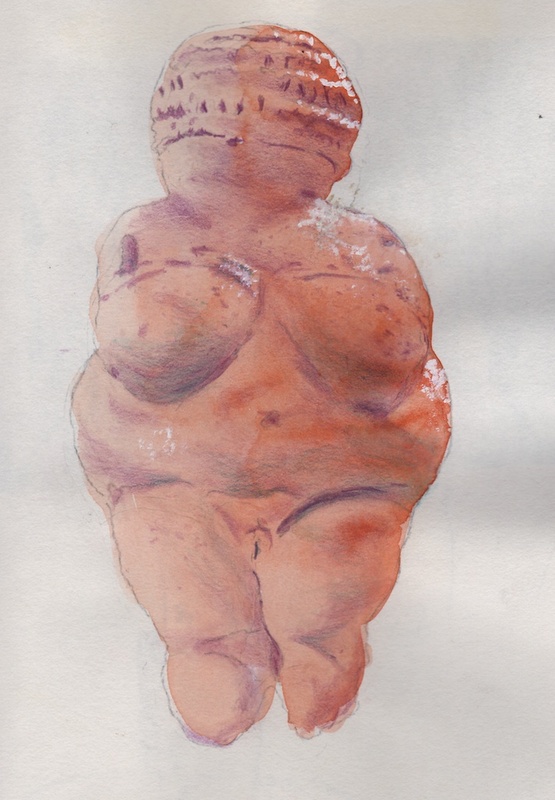 Willendorf herself is a statuesque as my Grandmother — “Nana’. It was Nana who nurtred me for my first 8 years of life. Maybe a touch of ‘Earth Mother here? Many of these objects were found in caves or dug up in fields. Perhaps left in the ancient settlements where they were carved. Though most of these figurines were eminently portable. To fit in the hand, to be carried in a satchel or on a belt. Even to be fondled. Inevitably they were found by men, 19th and early 20th Century men. A womanly figure was given the appellation ‘Venus’ This label adds layers of meaning to these figures which their originators may never have considered. Did they have a concept of art, of objects of aesthetic beauty? Where these objects prized in their own right, or did they have practical purposes which their originators considered to be useful for the survival of themselves and their family or tribe? Indeed do these questions have any meaning as the way these people thought 35,000 years ago is beyond reconstruction. As a typical example of a modern manI can only ever heap my own baggage on the shoulders of these seeming misshapen representations of women. The paper I am referencing is very clear about the *generalizing stereotypes* that these figures have provoked (White, 2006). White also acknowledges that the labelling of the figurines as embodiments of Venus and goddesses are a result of historical and intellectual contexts, as the previous paragraph agrees. Patricia C. Rice in a paper published in the Journal of Anthropological Research in 1981 called ‘Prehistoric Venuses: Symbols of Motherhood or Womanhood’ presents perhaps a more feminist perspective. Her hypothesis challenges what she describes as the belief of most experts that the function of the figurines in Palaeolithic society was solely that of glorifying fertility. The alternatives suggested by a minority of academics she lists as sexual or aesthetic objects, which I speculate on above, images of old women with links to witchcraft or superstitious totems.